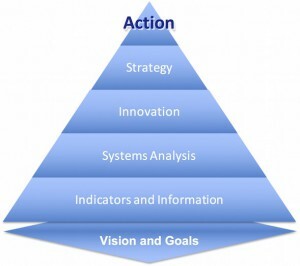 VISIS stands for Vision > Indicators > Systems > Innovation > Strategy — five critical steps in planning for sustainable development. VISIS is a way of working on sustainable development in whole-systems, inter-disciplinary way, usually in a group setting. It was developed by Alan AtKisson in the late 1990s to support local planning efforts and educational programs. Today, VISIS is used around the world in business, government, universities and schools. It is also ideally suited for working with the SDGs, the “Global Goals” adopted by world leaders in 2015. VISIS is an open-source methodology — that is, anyone can use it. 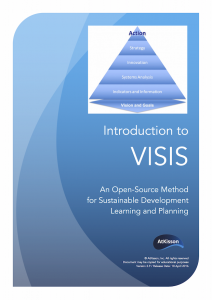 You can download a short introduction to the VISIS here: Download the Introduction to VISIS. But VISIS is also at the heart of the Sustainability Accelerator tools, designed to harness the power of the VISIS method for organizational planning and training. Please note that the Accelerator tools are proprietary and protected by international copyright. You can download an introductory version, called AcceleratorLite, for free. AcceleratorLite is has been widely adopted by teachers, community leaders, government officials, and many others, trained through our non-profit network partner Compass Education, or through our work on international development programs. Note: “VISIS” was originally known as the “ISIS Method”. “V” for Vision was always part of the method, so when the name “ISIS” became associated with militants in Iraq and Syria, we formally added the “V” to the name. Note that documents published before 2014, including Alan AtKisson’s 2010 book The Sustainability Transformation, usually refer to the ISIS Method.